To understand it, you must understand Caraquet. The northern New Brunswick town is a much longer drive down the NB-11 highway than you think it will be. The town, which in the 2011 census clocked in at 4,169 residents, sits at the top of New Brunswick’s Acadian Peninsula, a triangle of land with Bathurst, Lameque Island and Miramichi at its corners. The chunk of road that makes up Caraquet is L-shaped. There’s one Tim Hortons, where the signs are in both languages but you’ll barely hear a word of English. A smattering of community college buildings sit next to the hospital — named for the baby Jesus — and overlook the Baie des Chaleurs. Ten minutes later, on a part of the strip that is less quaint and more industrial, a blue sign appears alongside the road construction. It introduces Acadie Nouvelle, New Brunswick’s only French language daily newspaper. The first issue of Acadie Nouvelle hit the stands July 7, 1984. Before Acadie Nouvelle there was L’Evangeline, which held on for 95 years before it shut down in 1982. L’Evangeline came from Moncton in southeastern New Brunswick, the province’s second biggest city. Maurice Mourant is a former mayor of Petit-Rocher who wrote sports columns for L’Evangeline in his spare time. What drove him to establish a paper of his own was a belief in the strength of his home community. Mourant calls upon the duality of the French word “loin,” or far. “When you’re far from your readers, you’re far from your readers,” he says. A paper based three hours away in Moncton wouldn’t have the same resonance with the predominantly French northwest of the province as much as a local publication. And so with three others Mourant devised a plan to fund and produce a regional newspaper: by the north, for the north. They sold shares door-to-door, a campaign bringing in $350,000. Before long, the New Brunswick securities commission shut them down. Without a prospectus — a document to describe their company — the shares were illegal. Mourant and his colleagues returned the money and established the company Les Editions de l’Acadie Nouvelle Limitée. This time, says Mourant, they brought in $352,000. When that first issue went out in June of 1984 it was a regional paper, covering the Acadian Peninsula. It would stay that way for five years before becoming a provincial paper in 1989. New Brunswick is Canada’s only legally bilingual province. The 2011 census showed that 31.6 per cent of the population reported French as their mother tongue. While not all Francophones in New Brunswick are Acadian, the national pride is immediately apparent in the flags and stars that adorn thousands of houses on the peninsula. Just as Quebec is a nation within Canada, Acadie is more than just a region. Being Acadian is an identity. If you ask Francis Sonier whether he’s from Québec or New Brunswick, his answer is simple: he’s Acadian. Sonier is the current editor-in-chief of Acadie Nouvelle. The son of schoolteachers who moved from New Brunswick to Québec in search of better jobs, Sonier found himself on the Acadian Peninsula in the summer of 1990, a bachelor of communications and his CV in his suitcase. He applied to Acadie Nouvelle on a whim and thinks his status as a Québec-born Acadian looking to return “home” helped land him a gig as a reporter. He soon moved on to work as a video journalist with CBC, but returned to Acadie Nouvelle in 2008 for a job as assistant director, and was appointed to editor-in-chief in 2009. 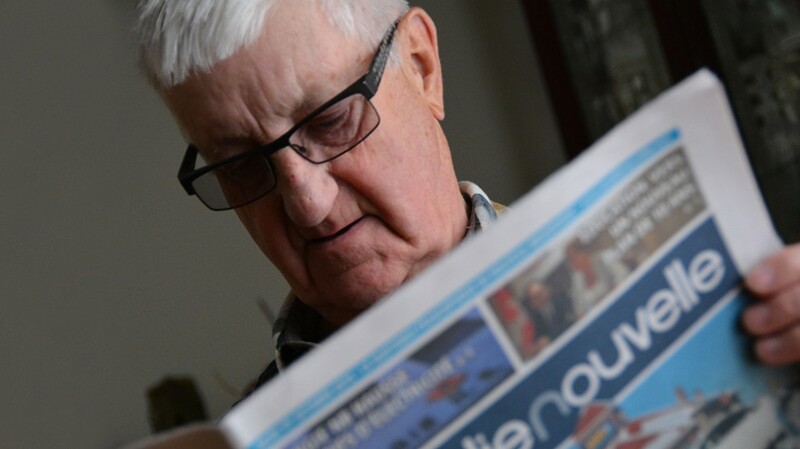 As the only francophone daily newspaper in the province, and one of just seven independent papers in the country, Acadie Nouvelle is under pressure from readers. Without a social role, it “would be just a retake of the Anglophone papers — it wouldn’t reflect our culture,” editor-in-chief Sonier says. Literally, the mission statement says “to inform and serve Acadians,” and “to promote and defend the rights of the Acadian community.” Sonier’s exchange of Acadian and Francophone is forgivable though: these days, Acadian issues are primarily ones of language. Stories about linguistic rights in the field of education — the separation of French and English school boards and buses, for example — as well as access to health and other services, are stories that Sonier says set Acadie Nouvelle apart from its competitors. Béatrice Seymour is a reporter for Acadie Nouvelle, and lives and works in Bathurst. While she has lived in the province for 20 years, she’s originally French and doesn’t consider herself an Acadian — something she sees as an advantage for her objectivity. “The more we live in a place, grow up in a place, we’re always a little bit biased,” says Seymour. Her colleague Robert Lagacé has a different take. Living in his hometown of Notre-Dame-des-Erables, population 757, Lagacé has developed a rapport with the people he covers. He’s been writing about arts and sports for the paper since 1985, and sees proximity as an advantage. “If we have a scoop, it’s because we have a good bank of contacts,” he says. Johnson calls upon “l’esprit de clocher”: the spirit of the steeple. While not a uniquely Acadian expression, it fits their situation neatly. Referring to having a close sense of belonging to your immediate community, it stems from a time when each town or village had a church to its name. With the steeple as the highest point, the church became where townspeople would literally and figuratively assemble. Acadians were all Catholic, says Johnson. The church was once inextricable from all community activities — the Archbishop of Moncton was one one of a few parties who had a stake in, and control over, L’Evangeline. Acadie Nouvelle founder Maurice Mourant even recalls a time of yearly collections for L’Evangeline taken up in churches in the northwest. As an independent newspaper, Acadie Nouvelle doesn’t have the ties to the church its predecessor did. The distinction between regions and communities, though, rings as clear as a church bell. The Acadians of northern New Brunswick seem like Québecois to their cousins in Moncton, while those in the south are too English for proud northerners, says Johnson. He thinks Acadie Nouvelle’s base on the Acadian Peninsula means their claim to cover the whole province is “a fiction.” One look at the obituaries and the advertisements, he says, shows where their reader base is. The cost of getting the physical papers to the scattered communities is substantial. Ever since it went provincial in 1989, the paper has benefitted from a federal and provincial trust fund which Sonier says provided about $600,000 in interest annually in the early years, allowing for the distribution of the paper. In 2010 Radio Canada put the interest at $212,000, and Sonier says it’s down to $180,000 in 2015. In August 2012, Sonier had to make a tough decision. He and the publishing board of Acadie Nouvelle elected to outsource printing and distribution to the Irving-owned, Moncton-based media conglomerate Brunswick News. Twenty people lost their jobs. Some of them had family members on the publishing board. In a community like Caraquet, where Sonier can’t go to the grocery store without getting feedback on the day’s paper, the consequences were deeply felt. Partnering with Brunswick News touches another facet of Acadie Nouvelle’s identity besides community: its independence. Linking up with the agency that controls all three other dailies in New Brunswick is something that never would have been done in the time of L’Evangeline, says Sonier. But having Acadie Nouvelle go out in the same canvas bags and vans that contain the Daily Gleaner in Fredericton or the Times & Transcript in Moncton means more money to ensure the content stays strong. “If we cut on content, we become less pertinent. Less pertinent, fewer people will read,” he says. Annette Boudreau says Acadie Nouvelle is most relevant as a regional paper. Boudreau is a professor at the University of Moncton specializing in Acadian studies. She says with technology making other papers more accessible, though, young people are going elsewhere for their news and broadening the scope of their sources. Boudreau herself subscribes to Acadie Nouvelle, Le Devoir and La Presse from Montreal, and the weekend edition of Toronto’s The Globe and Mail. But rather than accumulate stacks of newsprint, she reads them all digitally. Updated in January 2015, Acadie Nouvelle’s website is far from the cobbled-together affair you might expect of a small paper. The site is behind a partial paywall, offering eight free articles a month. While all 11,500-plus print subscribers are able to access the content online, in 2015 about 1,600 people chose a digital-only subscription package. In addition to individual articles, online readers can access a digital edition of the print version that can be flipped through page by page. 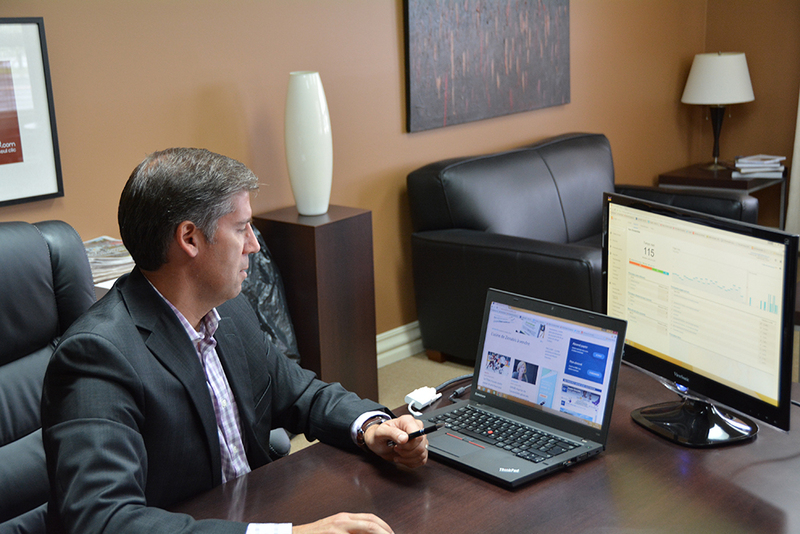 Web presence is something that Acadie Nouvelle aims to increase. With the site revamp they also ramped up their Facebook promotion, which brings in 60 per cent of their daily traffic. Newsroom director Gaetan Chiasson says that in the month of September 2015, acadienouvelle.ca reported 323,000 individual users. The 2011 census showed 233,530 people from New Brunswick reporting French as their mother tongue. Even allowing for multiple computers with different IP addresses that would drive up the user count, Acadie Nouvelle’s web presence appears strong within the province and beyond. Chiasson is familiar with the flexibility required for a changing media landscape. From his desk in the Caraquet office, he communicates with reporters scattered across the province over the video call service Google Hangouts. (Until a few years ago, they kept in touch via telephone.) Chiasson meets with editor-in-chief Sonier weekly to discuss the strategic plan, a roadmap for the paper’s success that used to be laid out on a 10-year basis, then five-year, and currently three. Chiasson thinks the plan will soon become annual. “No one can say where this industry will be in three years,” he says. The man at the start of it all hopes they can hold on to the paper edition. Maurice Mourant, now 76, thinks a move to digital would exclude older readers — the very citizens who supported the paper’s inception out of pocket some 30 years ago. Correction: In the first version of this story, Maurice Mourant was said to be the former mayor of Caraquet, not Petit-Rocher. The current version of this story has corrected the mistake. Main photo: Maurice Mourant founded Acadie Nouvelle. Thirty years later, he’s still enjoying the paper. Photo by Sophie Allen-Barron. Bonjour Sophie! J’ai lu avec attention ton article et je l’ai vraiement apprécié. Toutefois j’y ai décelé certaines erreurs: je ne fus pas maire de Caraquet mais de Petit-Rocher. De plus, l’Acadie Nouvelle hit the stands June 7, 1984. Le nom de l’hopital de Caraquet est Hopital Enfant-Jésus et non baby Jesus. Je te souhaite la meilleure des chances et de belles fetes.